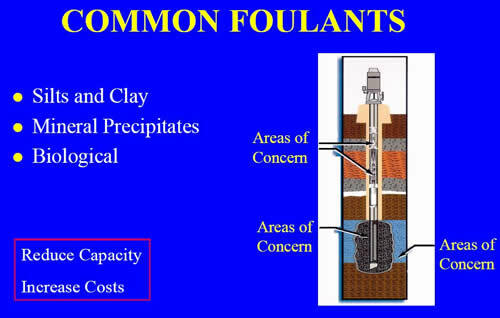 Recovery wells are often fouled with microorganisms, hydrocarbons, and iron deposits. Often these “biomasses” foul the pump intakes, screens, pump packing, and the formation near the pump intake. Remediation Services has developed a unique process utilizing chlorine dioxide and specialty cleaners to clean and disinfect these wells. in situ in the casing of the well. A pelletized chemical product is dropped in the well. As the chemical dissolves chlorine dioxide is generated. This becomes a convenient and safe method of applying one the most effective industrial disinfectants. The chlorine dioxide is then surged to disinfect the screens, packing and formation. Chlorine dioxide can be combined with iron solublizing treatment to remove iron/biomass deposits. Chlorine dioxide is less corrosive than chlorine or hypochlorite treatments. The process can be effectively used on recovery wells as well as sparge and SVE wells which have biomass or biomass/iron or biomass/hydrocarbon fouling.